To say I’m already missing summer is an understatement. The hubs and I spent the weekend in Arizona to celebrate a dear friend of ours marrying his love, and while the overall desert landscape left something to be desired for this lake and tree-loving Minnesotan (though this view took my breath away time and time again), we spent a good portion of the weekend wondering why we love to live in the blustery, snowy (though more currently, rainy and dreary) Midwest. A few days of constant sunshine and 80-degree weather in November will mess with you like that. Before the weekend, however, while still in the aforementioned lake and tree-filled though rainy and dreary Minnesota, I was spoon-deep in this tropical parfait, feeling anxious excitement over the fact that in just a few weeks, it’s Thanksgiving (my second favorite holiday) and a few weeks after that, Christmas (my favorite holiday). Obviously my mind is conflicted between wanting to go back in time and wanting to jet ahead of it — season-wise that is. 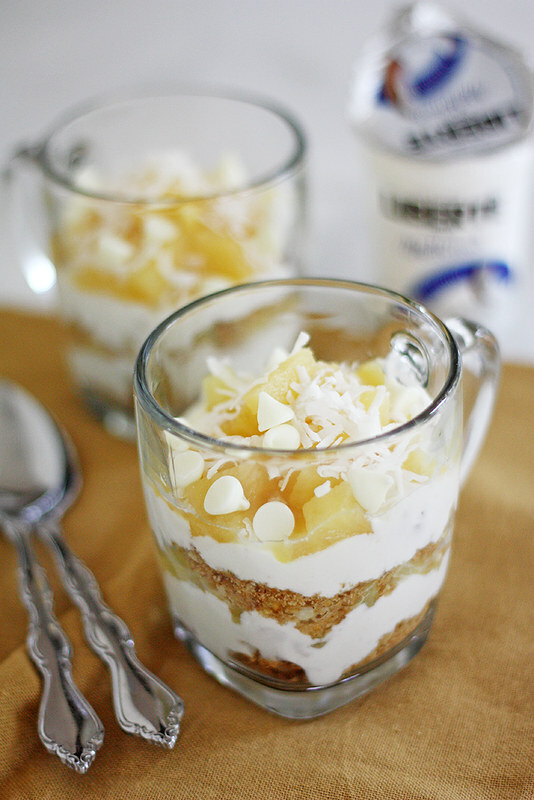 I created this pineapple-macadamia nut parfait as part of Liberté Yogurt’s “Perfect Pairings” series. The decadence and mild sweetness of Liberté Méditerranée coconut yogurt pairs, well, perfectly with the richness of flavors imparted by the tart pineapple, white chocolate chips and honeyed granola. To say this is a healthy breakfast would be an exaggeration, but sometimes we need a little indulgence to start our days. More appropriately, though, this parfait makes for an excellent dessert or mid-afternoon snack — the kind when you need a few moments to escape from the rain and overall dreariness outside your window, either back to summer or ahead to the holidays. Though I suppose if this parfait is in front of me, I wouldn’t really want to be anywhere else. In a food processor, process granola bars and nuts until crumbled. In a small bowl, fold whipped cream and white chocolate chips into yogurt. In a separate small bowl, combine pineapple and honey. Spoon a couple heaping tablespoons of granola mixture into the bottom of 2 parfait glasses. Top with 1/4 cup of the yogurt mixture, then 1/4 cup of the pineapple mixture. Repeat. Garnish with shredded coconut and more white chocolate chips. Serve immediately. It may be fall, but this is pure summer in a parfait glass….power food and delicious, too! I love a good parfait and this one looks amazing! Can’t wait to try this. Easy to make and yummy! I love little escapes to paradise (as I WI resident/former MN resident, I completely understand your mixed seasonal feelings), and these parfaits are perfect! Liberte coconut is one of my favorite “treats” when I need a pick me up, and I’m all over how you’ve jazzed it up. Is that the beach boys I hear playing? I loves me some Liberte!! and oh my does this sound good!! We need to catch up soon my dear! Neat! So many fabulous flavours in here. Would love this for a mid-morning snack right about now! While I do enjoy the snow in the winter, I’m already missing summer too. I lived in Arizona for a hot minute (no pun intended) and loved that winter time consisted of 70-degree weather and blue skies. 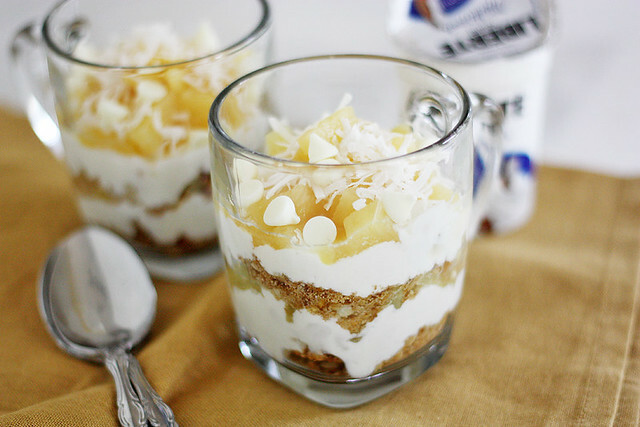 We can cheer up our need for warmth and sunlight with these deeeeeeelicious pineapple macadamia nut parfaits! SO good! I hear ya. It’s already soo cold, and thinking about it getting even colder kind of makes me want to cry. This looks like it might help those winter blues! Oh man, Arizona is one of my most favorite places in the whole world. I love the heat and the landscape. It is definitely beautiful. My favorite area is Sedona and all the gorgeous red rocks. Ok, enough daydreaming about warmer places. Let’s talk parfait. I am still enjoying summer flavors over here so no worries. I could totally dig my spoon into this! PS I can’t believe your baby is a lemon! So big already! I’m already missing summer too. And while I love all the extra sleep that winter naturally brings to us, I hate the dreary and wet weather. Arizona sounds pretty good right about now! This parfait looks delicious. Congrats on the baby news too! So exciting. 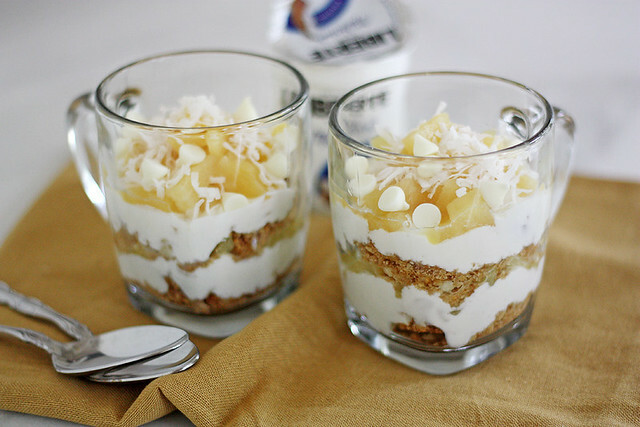 Oh I need this parfait in my life, I could use a mini tropical vacation! I’m definitely excited for the holiday season but if time could slow down just a tad bit, I also wouldn’t complain!! SO much to do in so little time! I feel like time, or your perception of it, must slow down while indulging in one these. What a treat!